Beautiful Pie Carrier Nantucket Lightship Basket with a cherry base and 8 very distinctive cherry wood staves, combined with elegant traditional Nantucket basketry cane staves gives this special Nantucket basket a very contemporary look! I personally craft this Nantucket basket featuring a highly grained cherry wood base, and two carved cherry wood swing handles, attached with your choice of bone or ivory knobs and brass washers. Traditional rattan reed rims which are dyed. 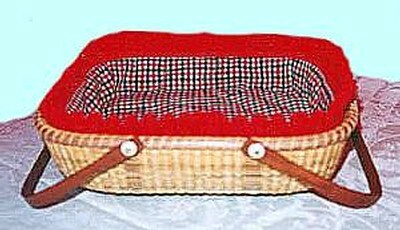 This Nantucket Basket measures 12" square, 3" high at rims and 8" high at handles. Fine craftsmanship and attention to details! Signed and dated by the basket weaver. The Pie Carrier Nantucket Basket makes a stunning display for your pie or on a counter and even to deliver a special pie as a food gift basket. Although I am no longer accepting orders for the Pie Carrier Nantucket Basket, I do craft one or two of these per year. When available for sale, you can purchase it directly from my Simply Baskets website.